BR549 typifies--indeed defines--what a hip hillbilly outfit sounds like in this god forsaken modern age, God love 'em. They embody that infectious quality of genuine country music that goes so far as to demonstrate classic American qualities that have little to do with Wall Street, bling bling, iPod, botox, or all the other newfangled things we seem to be more about now. The band formed in Nashville in the mid 90s. At that time there was a cool scene down on Lower Broad--before it got all fixed up for the tourist trade, and it was nice and seedy. Legends, Tootsie's, and a bar/bootery called Robert's Western Wear were all rocking nightly, with a lot of edgy talent and a very mixed clientele of college kids, the rock crowd, and tourists and locals of every description. BR549 would set up in the window of Robert's and play the long night away. The swelling throng and the downtown pulse led to their signing with Arista and the first EP in 1966, Live From Robert's. And they hit the road. This great rockabilly group almost disappeared a few years back. After a handful of successful records with SONY and Arista, huge concert tours with the likes of Bob Dylan and the Black Crowes, and the best press a band can even hope to have, two members left and they went into a tailspin. 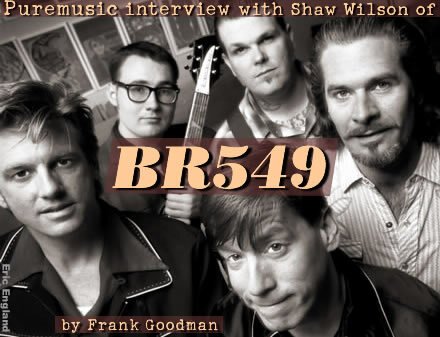 Bassist Jay McDowell and co-founder and co-lead vocalist Gary Bennett split the group after they did their Sony/Lucky Dog release in 2001, This is BR549. After five years as the international critics' darlings, BR549 went back to Lower Broad. This time to the Bluegrass Inn, with the Hillbilly Allstars. Lots of new and old friends were sitting in, and new chemical elements were forming. A doghouse bassist named Geoff Firebaugh, veteran of both the Gulf War and various punk and alt country combos in Seattle and Nashville, became one of the new clan. And their old very young friend Chris Scruggs (son of Gary Scruggs and Gail Davies, grandson to both Earl Scruggs and Tex Dickerson.) was becoming an integral part of their new sound. The remaining original members were Shaw Wilson (drums and vocals), Don Herron (probably anything with strings, but mostly Hawaiian steel, fiddle, and mandolin), and lead vocalist/guitarist and main songwriter Chuck Mead. Without a label or producer for the first time, the band came up with the dough to record a new CD, wrote all their own songs for the first time, and used their soundman Keith "Cowboy" Thompson as the engineer and co-producer, and Ray Kennedy to mix. Tangled in the Pines got picked by the maverick Dualtone Records, the home of many of our favorite acts these days. BR549 is now back on the road, with a building head of steam and a promising future again. We'll probably hear they've gotten picked up by some very big group to go on tour with them any minute.